It's official: Coloring is not just for kids anymore! Wales-based illustrator Millie Marotta's clever, intricately detailed black-and-white designs irresistibly invite artists of all ages and abilities to add color and doodles. 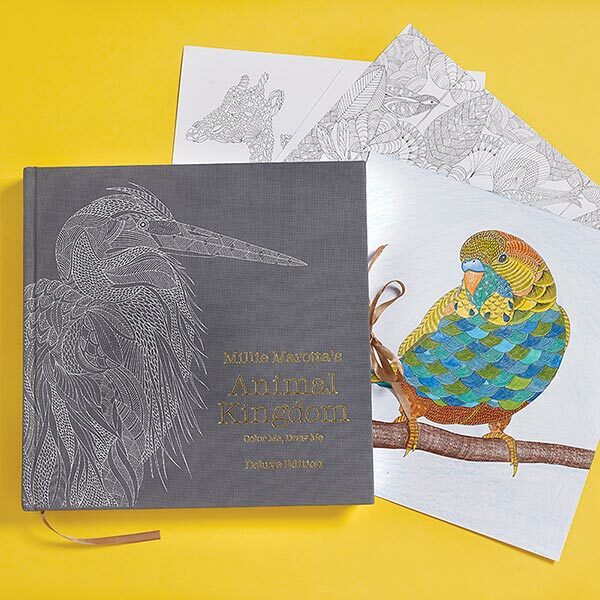 With scores of delightful images printed single-sided on extra-thick art paper - along with a lovely embossed cover, ribbon tie-closure, and bookmark - our new Animal Kingdom Deluxe Edition is extraordinary. Color a majestic owl made of tiny flowers and leaves, pretty butterflies with delicately detailed wings, an adorable pair of squirrels sharing an acorn, and many other beautiful beasts. Five pullout prints, perfect for framing once your personal touch has been added, are included as well. Just find a cozy workspace, clear your mind, and let your imagination run wild! See also Millie Marotta's Animal Kingdom Postcards.